Elixir has taken our office by storm, with special thanks to a few Elixir evangelists in the office. Three out of eight of our current client projects at Gaslight use Elixir and Phoenix. We even have two developers speaking at ElixirConf next week! Is This Post For You? If you’re like me and just found yourself working on an Elixir project, unsure of how to set things up but hungry to learn, this post is for you! However, this post will not go into detail on actually making a new Elixir and Phoenix project from scratch. The information here will be most beneficial if you are working on an established Phoenix project. I am in no way an Elixir expert, so I am still trying to learn about the language myself. I hope this post will help you, as a front-ender, know what you need to know about Elixir so that you can understand how to set up your assets and maneuver your way around the project. Note that file structure (especially around assets) has changed in a recent update to Elixir. Because of this, some of the details here might not apply if you’re using Phoenix version < 1.3. If you don’t have a Mac and don’t have Homebrew, view these instructions. And there you go. After that, you’ll have Elixir installed on your computer and you’ll never have to do it again! (Except you’ll need to update your Elixir version every once in awhile). With this command, you’ll install all the Elixir and Phoenix dependencies in your project. Ecto is a database wrapper for Elixir. To get your database setup, you’ll need to run these commands. When I did this, I ran into some gnarly postgres errors. I won’t go into detail for sanity’s sake, but for this part of the setup to work you’ll need postgres to be working. You can figure out how to get that setup here. Next you’ll need to install the dependencies that are handled with node. You’ll need to run a different command depending on whether you’re project is using npm or yarn. Npm is what your Elixir and Phoenix app will use by default, but we’re using yarn in the project I’m working on currently. Run this command after setting up your dependencies. Or maybe your developer teammates (or you! I’m all for front-end empowerment) set up a bin/ command. The /bin folder is in place for different scripts. For example, we have a bin/server file that contains the mix phx.server command. So that way, if we type literally bin/server it will run whatever commands are in that file. Rad. Now you can visit localhost:4000 in your browser to check out your app! So now once you’ve got your shiny app running you may be asking yourself “which things were a one time thing and which things will I need to do again?” Well, good question. Whenever you want to see your app running you will need to start your server with the above command, mix phx.server. The great thing about Elixir and Phoenix is the hot reloader that reloads the page whenever you make a change in code. That comes in handy! Often the terminal or view of the app will tell you when you need to do these things via an error, so keep an eye out and you’ll be golden. This is what our file tree looks like. This will be different depending on what version of Elixir you’re using. Here’s a breakdown of the folders that will matter to a front end person. /assets - This is where your css, js, and “static” folders will live. The ‘/assets/static’ folder is where fonts and images will reside. /lib - This is where your templates will live (aka your HTML sprinkled with cool Phoenix logic). If you’ve used Rails you probably had .erb files. In Elixir, that extension is .eex. These .eex files exist in lib/[project-name]_web/templates. Within that, there should be a layout and page folder. In the layout folder there should be something called app.html.eex which exists as your most outermost template that most likely renders a page that exists in the page directory. This can be confusing if you’ve used Rails because templates exist in a views folder in Rails. But you may see in Elixir there’s a views folder that means something different. The first thing I usually want to do once I’ve gotten a project running locally is set up sass so I can start setting up my css files. Here’s how you would do that in Elixir/Phoenix with Brunch. 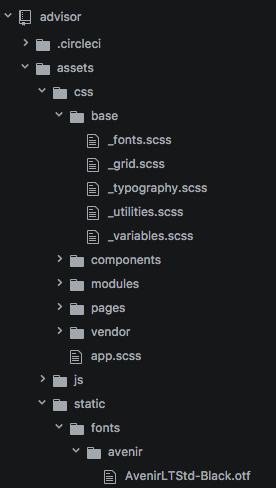 Then after that, you’ll need to change the name of your main css file to have a sass extension, going from assets/css/app.css to assets/css/app.scss. From there, you should be good to start setting up your sass files! Web development can be a cruel world. A place where fonts never load correctly on the first go. Or second. Here is what our file tree looks like around our assets. See the third line there? One stumbling block I had when configuring this was that I had copied my font sass file from a Rails project. The problem there was in Rails you often have to do weird things because of the asset pipeline like use asset-url instead of just url. In Elixir and Phoenix, you don’t need to go through the trauma drama of figuring out how the heck to work with the asset pipeline. So keep it simple with just url and it should work! But…do you configure this route to go from the _font.scss file, app.scss, from the app route, from the assets folder, or the hidden _/build folder css files or wherever things end up? There are so many possibilities when you’re left to guess. Well, the answer is none of those! Static assets like fonts and images within assets/static are copied to priv/static. So then if you have the default configuration of Brunch, everything in priv/static is served from /. So instead of referring to the example font above with the url assets/static/fonts/avenir/AvenirLTStd-Black.otf (which is the full path from the application’s root),you would leave off assets/static and just use /fonts/avenir/AvenirLTStd-Black.otf like I did in the above example. This forum helped me figure that out. Now that you’ve done tons of great work setting up your Elixir and Phoenix project on your machine, you probably still are confused by all the terms being thrown around. Me too. A dynamic, functional language designed for building scalable and maintainable applications. A web framework for Elixir. The speedy and established language that Elixir was built on top of. Stands for “Open Telecom Platform”. A collection of useful middleware, libraries, and tools written in Erlang. Makes it so Elixir and Phoenix code can be sorted into project files. If you’re used to Ruby, Mix is like Bundler and Rake combined. A database wrapper for Elixir. If you’re used to Ruby, Ecto is like Active Record. A package manager that comes with Elixir. It was built for all of Erlang. If you’re used to Ruby, Hex is similar to RubyGems. A build tool, an alternative to Webpack, and comes with Elixir by default. A Node package manager. An alternative to npm. So there you have it. I hope this helped you, as a front-end person, to get started on your Phoenix project. I hope to see more documentation for designers, front-end developers, and more out there for Elixir.